As it weaves through the wooded hills of Tuscaloosa County, Ala., the Black Warrior River tumbles from an elevation of near 240 feet to below 100 feet in a span of less than 30 miles. In centuries past, that precipitous drop produced rocky, shallow rapids as the river plowed through what is now downtown Tuscaloosa. Today, that drop in elevation is eased by a trio of structures: John Hollis Bankhead Lock and Dam at Black Warrior River Mile 365.5, Holt Lock and Dam at Mile 347 and Oliver Lock and Dam at Mile 337.7. 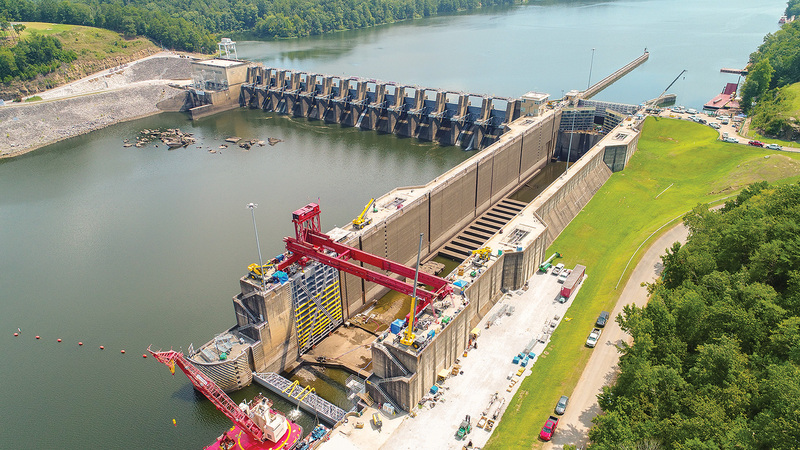 The U.S. Army Corps of Engineers owns and operates a total of six locks and dams on the Black Warrior-Tombigbee Waterway that all measure 110 feet by 600 feet. Bankhead and Holt offer by far the highest lifts on the system at 68 feet and 64 feet, respectively, with Oliver adding another 28-foot lift. 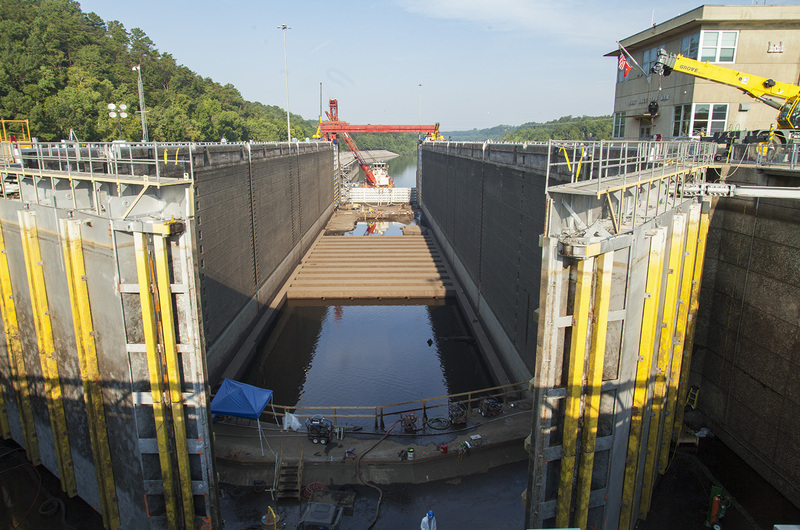 The Corps team that manages the Black Warrior-Tombigbee Waterway along with lock maintenance contractor R&D Maintenance Services Inc. and Barnhart Crane & Rigging, is wrapping up a major repair project at Holt Lock, which first opened to navigation in 1966. The primary task during the 34-day closure at Holt, which began July 10, was replacing the lock’s lower miter gate. 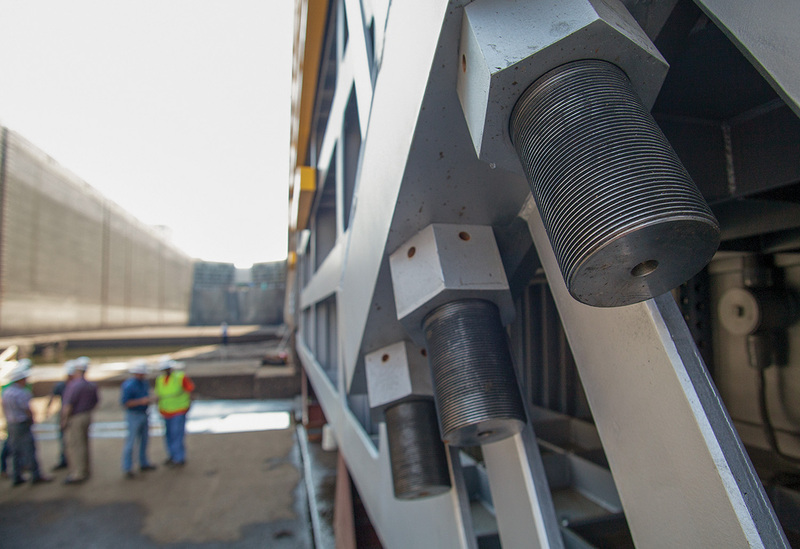 G&G Steel of Russellville, Ala., fabricated the new gate leafs and transported them to the lock by barge from their facility in Iuka, Miss., via the Tennessee-Tombigbee Waterway, then up the Black Warrior River. The new gate leafs arrived on site ahead of schedule on July 2. 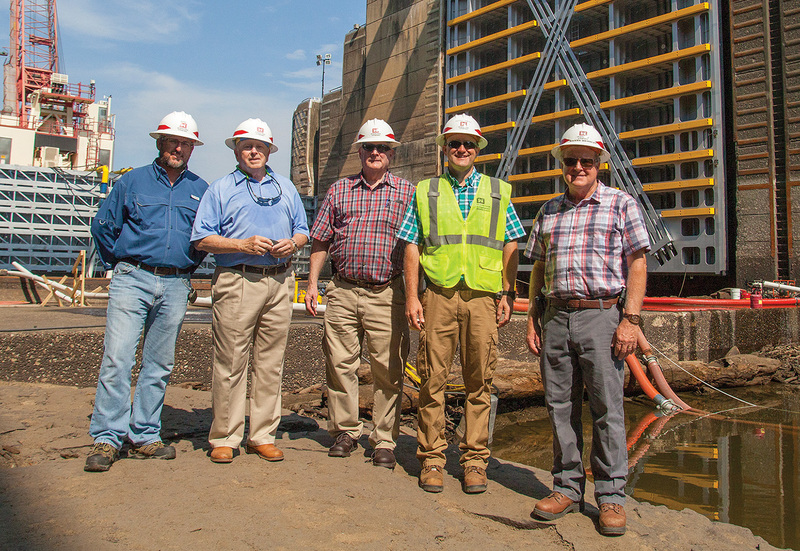 Just as they did two years ago at Selden Lock and Dam farther downriver, the maintenance team at Holt used a gantry crane spanning the lock chamber to lift and lower the old gate leafs onto a deck barge and to install the new leafs. 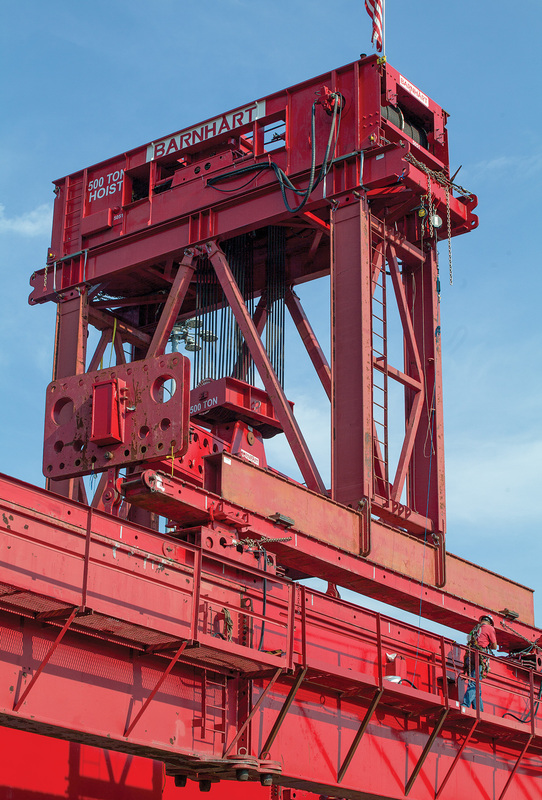 The sprawling Barnhart gantry crane used in the operation was made up of two 150-foot-long, 8-foot-tall girders spanning the lock chamber. Each weighed 230,000 pounds. Atop the girders was a hoist with a lifting capacity of 500 tons. Removing the old gate leafs and setting the new leafs in the gate recesses on temporary stands was a methodical process that spanned four days. The first new leaf was set on a brand-new nickel pintle ball July 30, with the other leaf set August 1. 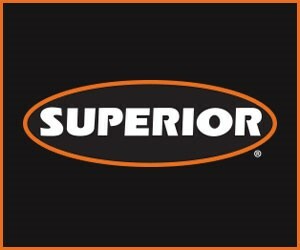 “Most people don’t realize nickel is a valuable metal used in alloys to make things other than nickels,” Hensley joked. Ferguson said the new leafs each weigh about 375 tons—35 tons more than the old leafs. The new leafs each feature three positive and three negative “gate diagonals,” which are adjustable, angled tension rods. G&G pre-stressed the gate in its fabrication facility, and the Corps team had the ability to adjust the diagonals after the gates were set using hydraulic jacks. The redesign of the gate diagonals was a lesson learned from Selden in 2016, Hensley said. Hensley said pre-stressing the gates at the fabrication shop with the hydraulic jacks worked so well that no additional adjustments were required at the lock. The new gate leafs also feature low-voltage anodes for reducing corrosion and synthetic timbers, among other modernizations. At the top connection of the new leafs, the Corps also repaired the mule head anchors, which is where the leaf ties into the chamber lock wall. And while the new lower miter gate was the most pressing task at Holt, the team was busy elsewhere at the lock throughout the month-long closure. 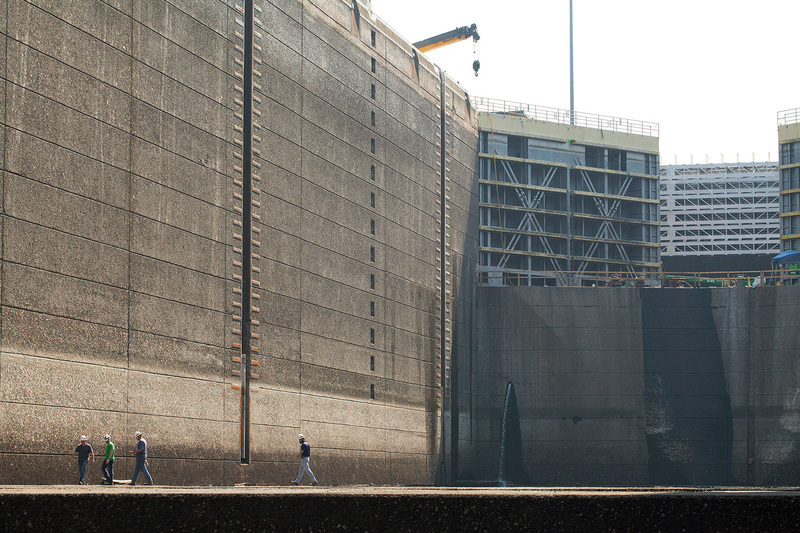 The Corps replaced much of the hydraulic piping located in galleries at the lock, which is critical to operating the valves that flood the chamber. Those pipes were heavily corroded from decades of use in a damp environment. The new carbon steel piping features a ceramic coating to fight corrosion. In all, about 1,200 feet of piping was replaced at Holt. 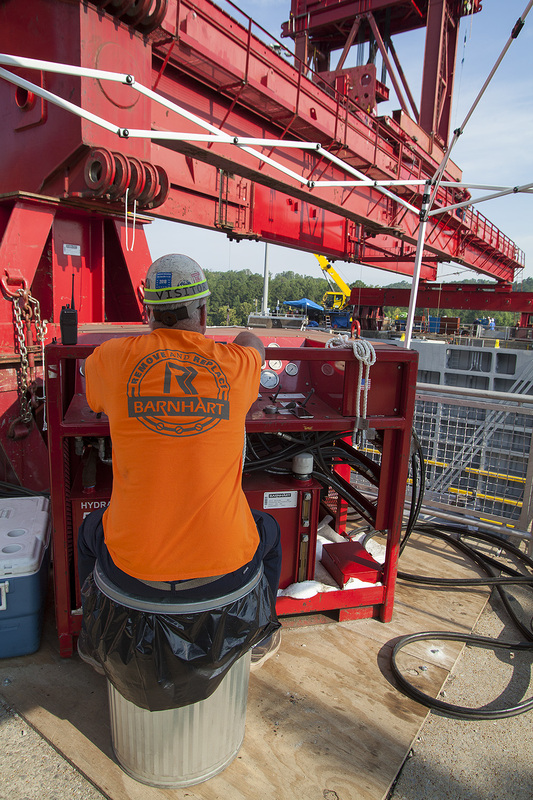 “That’s almost a quarter mile of pipe,” said Wynne Fuller, operations division chief for the Mobile Engineer District.While the upper reach of the waterway was closed, the Corps also replaced 200 feet of piping at Bankhead Lock, Hensley said. West Alabama Mechanical Inc. of Moundville, Ala., was the subcontractor in charge of replacing the pipe. Crews were also busy making repairs to the smaller upper miter gate at Holt Lock during the closure. As part of the contract to fabricate the new miter gate, G&G is also building new valves for Holt Lock. Hensley said those will be delivered in 2019. One surprising sight at the bottom of the dewatered lock chamber: bedrock. Besides the usual tools, tires and rims, walnuts, bolts and driftwood found on the floor of the dewatered chamber, maintenance crews and visitors also spotted an occasional hunk of coal among the debris. That’s no surprise, since coal is such a vital cargo on the Black Warrior River, with several large coal mines on the upper reaches of the waterway. 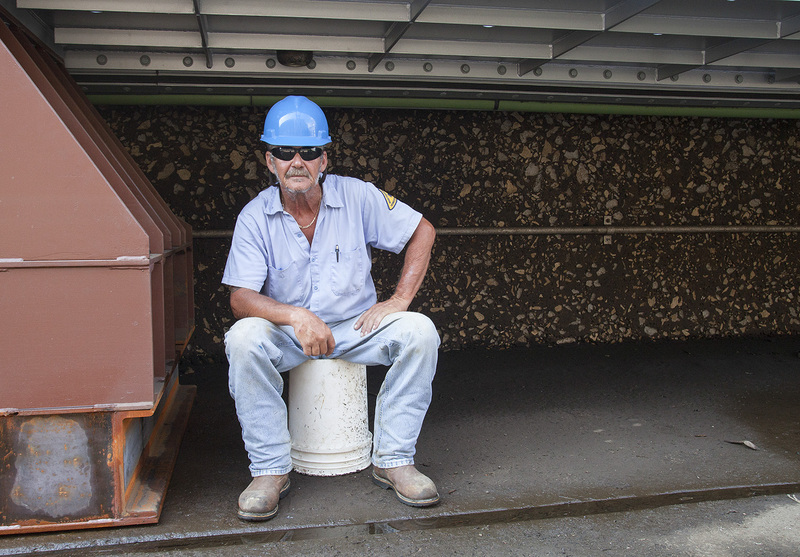 “Our biggest commodity is coal,” lock supervisor Ashley Ward said. The vast majority of tonnage passing through Holt Lock is metallurgical coal bound for export from the Port of Mobile. And now with the new miter gate at Holt, the entire Black Warrior-Tombigbee Waterway is up-to-date on lock maintenance and in good working order. That reliability throughout the system is a great driver of commerce, said Larry Merrihew, president of the Warrior-Tombigbee Waterway Association. 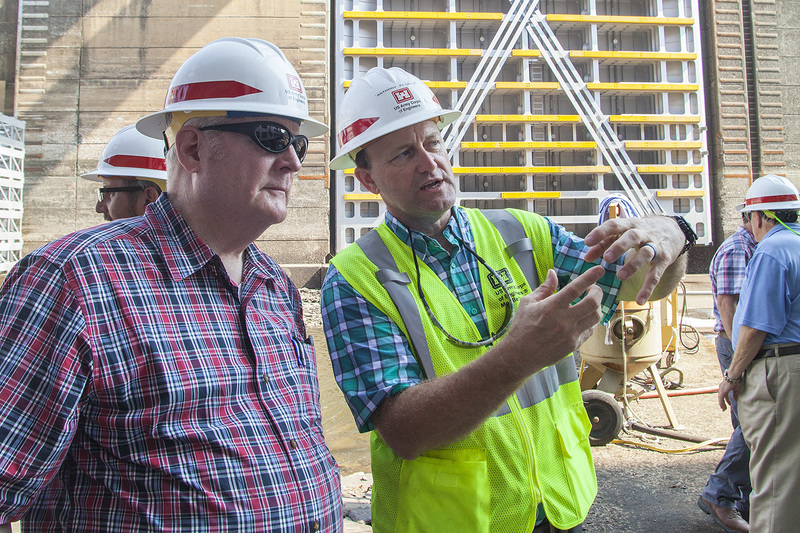 “Because we have such an efficient river system, thanks to what the Corps is doing to keep these locks running, we’re seeing more and more economic development opportunities,” Merrihew said.